As we get closer and closer to the July 7 release of Spider-Man: Homecoming, anticipation is higher than ever, and while we still have a few months to wait, a hilarious parody mashes up Spidey's world with the unique visual style of the music video for the Bruno Mars song "That's What I Like." The original video, which you can also see below, simply features Bruno Mars singing and dancing, while various objects are drawn in around him. 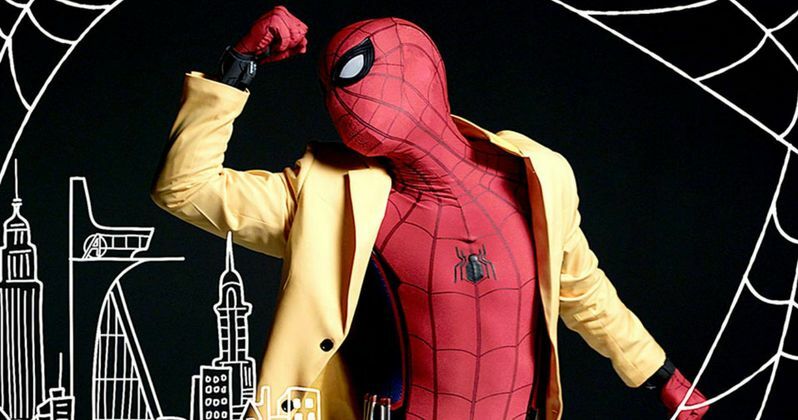 This parody features a dancer in a full Spider-Man costume, complete with the yellow school blazer Spidey's seen wearing in the Spider-Man: Homecoming poster. Nerdist debuted this video earlier today, which comes off the heels of their Beauty and the Beast parody "Belle and Boujee," which spoofs the hit Migos song "Bad and Boujee." This video features prolific dancer Ben Carter as Spider-Man, in a routine he choreographed himself. The new song lyrics, written by Andrew Bowser, Erik Kozura, Jason Nguyen, Joan Ford, with vocals by Jay Long, feature plenty of references to the Spider-Man: Homecoming story, including a few shout-outs to Tony Stark and the events of Captain America: Civil War. Here's the official description for this spoof video below. "Sometimes you just have to take a moment to appreciate the finer things, especially when you're living That Spidey Life. In this music video parody of Bruno Mars' "That's What I Like", Spider-Man sings a smooth pop anthem about all the stuff that makes life worth living, but instead of limos and lobster tails he's talking about web slinging and wall crawling. And just like Bruno, Spidey has his eye on a Manhattan penthouse, but the one he wants is in the Avengers Tower. Bringing in elements from both classic Spider-Man stories and the upcoming Spider-Man: Homecoming feature film, this video from the makers of Belle and Boujee is the perfect soundtrack for anyone just trying to live That Spidey Life." We've seen in the Spider-Man: Homecoming trailers released thus far that Peter Parker wants Tony Stark to let him do more, but there is only so much Tony will allow him to do. This song certainly alludes to that relationship, with one of the early lyrics making reference to the epic Civil War airport scene, where Spidey "took down Ant-Man" because Tony wanted him to. Of course, at the time, Ant-Man was actually Giant-Man, with Team Iron Man using Peter's suggestion of tying up his legs like in Star Wars, to take the Giant-Man down. There are even references to Infinity War and Robert Downey Jr.'s now-classic line of "Underoos," while the chorus features references to Spidey's web shooters and the web wings we saw in the trailers. This song doesn't make any references to another pair of villains, two different versions of the Marvel character known as Shocker. We reported earlier this month that Bokeem Woodbine will be playing the Herman Schultz version of this character, while Logan Marshall Green is playing the Jackson "Montana" Brice version of Shocker. Both of these characters work for Michael Keaton's Adrian Toomes, who ultimately becomes the villain known as Vulture. Using scavenged alien technologyThe Tinkerer (Michael Chernus) creates new high-tech weapons for Vulture and his crew to use against Spidey and anyone else who stands in their way. Take a look at the new parody video That Spidey Life, along with the original Bruno Mars music video, as we wait for more on Spider-Man: Homecoming.